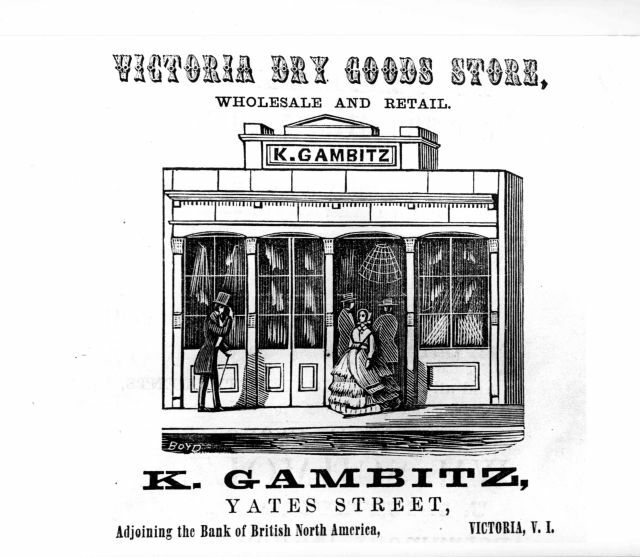 Kady Gambitz travelled from Nevada City, California, arriving in Victoria in 1858. He opened the first dry goods and drapery store in Victoria on Yates Street, the main business district. In 1859, he opened a new store on the corner of Yates and Government Streets. 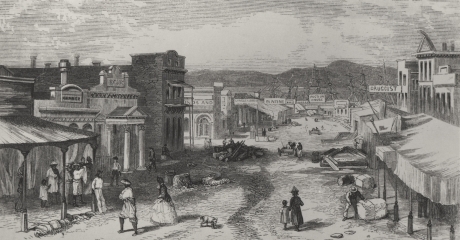 K. Gambitz’ Victoria Dry Goods Store appears on an engraving between the Bank of British North America and the Delphi Saloon. Kady Gambitz’ Store 1862 Victoria, on the left between the first store and the pillars of the Bank which is the third building. Kady Gambitz was a director of the B.C. Overland Transit Co.,organized (1861) to bring passengers from Canada to the Pacific. Kady Gambitz promoted Victoria as the main supply center for the gold miners coming from San Francisco, providing an alternative to going inland from Portland to the Cariboo. He encouraged the permanent settlement of families in the colony. Gambitz was a charter member of the A.F. & A.M. Masonic Victoria-Columbia Lodge #1 in 1860. He was also a member of the Agricultural and Horticultural Society (1862). In Nevada City, California, Kady Gambitz was the President of the Jewish Benevolent Society. The first meeting of the Jewish community took place in Victoria, in 1858. Gambitz was a participant, as both a member of the Congregation and a Mason,at the laying of the cornerstone of Congregation Emanu-El of Victoria in 1863. Kady Gambitz married Regina Ross in San Francisco, in 1863. A son was born to them in 1864. The Gambitz Family left Victoria in Mid-1865. Cyril Leonoff, editor, “Pioneer Jews of British Columbia,” Western States Jewish History 37/3&4. Sarah H. Tobe, “Lured North of the 49th, Jewish Colonial Roots,” Western States Jewish History 46/2&3. Archives of Sarah H. Tobe, Cyril E. Leonoff, Christopher J.P. Hanna, and David Rome. Sarah H. Tobe is curator of this Kady Gambitz exhibit.